There are just some little things that I take pleasure in. Some 'have to have' things. I haven't bought any in a really long time. They've slowly disappeared to where now, I'm down to a blue one and an orange one. So I 'felt' it was time to replace. I love these pens! I like the way I write with them (felt tip) and the colors! Just one of those office supply loves. What are your little indulgences? I WANT to know! 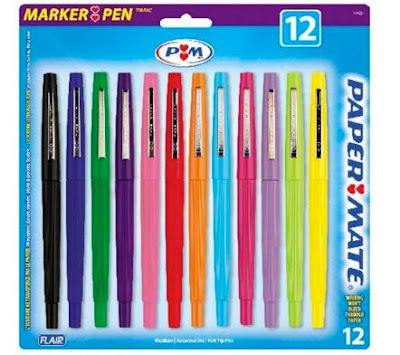 These pens and the sharpie pens are my favorite!!! I love a Flair marker...love them!!! I also LOVE a #2 mechanical pencil. I don't write with much else if I can help it! !